CANADIAN CONQUEORS CARDIFF AT THE RED BULL THREE DEGREES Around 6,000 people flocked to Cardiff Oval Basin today, one of the hottest days this year, to witness legendary rider Jay â€˜The Beast’ Miron from Canada take first place at the Red Bull Three Degrees BMX event. Becky, Marketing co-ordinator over at Hotwheels sent me an E-mail to inform me about their latest team rider trip to Scandinavia. Together with the pics it makes for a good tour report for FATBMX. Read on what Becky and the boys experienced on their trip up North. I just wanted to let you know that the Hot Wheels roooooadtrip went real well and we returned from Scandinavia last week! We visited Gothenburg and Stockholm in Sweden, Oslo in Norway and Copenhagen in Denmark - it was amazing! I really didn't know what to expect, all I wanted was for the guys to have fun, get to ride some different places, sample the local night life, meet new people and friends! and on top of all that I wished for good weather!! I guess that is actually quite a lot to ask for when visiting new countries, you can never be sure the way things will work. ROOTS JAM ORLANDO FLORIDA 2004 â€œGoing back to the ROOTSâ€? was decided a minute after last years Roots jam, this is gonna be in my schedule every April from now on. Florida is not the worst place to travel to in April, nice weather, good nightlife, friendly people and what more. Over 160 amateurs thought that too and with lots of flatlanders and Pro’s it made this one of the biggest comps in the USA. If you're living in the United States you might think that Flatland is dead. Yes, it got dropped from the X-games and it seems like there are not too many riders around in SoCal to shoot photo's of for the magazines. This doesn't help the popularity of flatland riding. But do the riders care? I don't really think so. The tight flat community is making things work for themselves. With Braun, Eastpak and RedBull as supporters of the flatland art, things are even looking quite good. A rumored 5000 flatlanders live in Japan with 800 based in Tokyo alone. Must be big-time there. It might not be as big in Europe but it's not slowing down either. Street The street course had to be put together in 2 days. 3 days were planned for the set-up but when the crew arrived it was cut down to 2. This meant long hours for the ones involved. The course had some new obstacles with a huge angled curved wall in one corner and different types of quarters in the other 3 corners. In the middle they'd put up a spine with hips on the west side and a jump box on the east side of it. On the far far west a double jump-ledge-hipped-quarter obstacle was constructed which all in all made for a decent street course. The street area was open all weekend for practice. The HARO duo of Ryan Nyquist and Dave Mirra showed up and were accompanied with Euro boys Anthony Pill, Ben Shenker and HARO distributor riders Senad Grosic, Ben Hennon and Ben Manuel. Yes, the 2 British Ben's are now forming the HARO squad in the UK. Further riders from SE, FELT, Standard, WeThePeople, Country Bikes, MacNeil, Hoffman and a bunch of UK individuals were enjoying riding the course without much pressure. 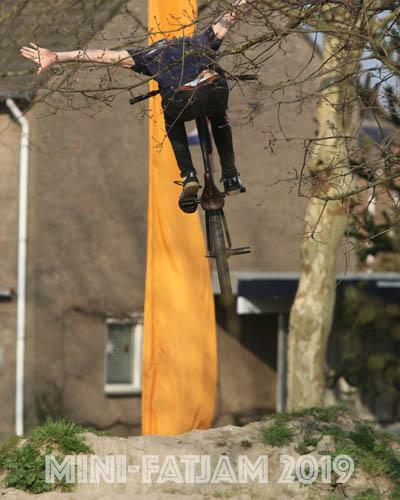 With covering street riding and flatland at the 25 years of BMX event in Eindhoven earlier this month, the Mini-FAT-JAM (little brother of..) had miniramp riding and dirt jumping in mind. On Saturday the PA was installed at the rather new miniramp at the Bosscheweg in Aarle-Rixtel. With a bunch of banners, flags and EZ-Up tents set up, it actually looked quite good. The weather cooperated with sunshine all day long and that was exactly what we needed to open the BMX outdoor season. From 13:30 - 17:30 the ramp was used non-stop. Highlights on the mini were brought by Ricardo Moes, Dennis Keunen and Daniel. Let's start off with Daniel. The name had been circulating on the Dutch scene as "The New Barry". We don't have many talent in Holland so "another Barry Kohne" is always welcome. Daniel has the flow and pulled the first fufanu on the fence and made it look so easy. He also pulled tailwhips, high airs and tech liptricks on his pegless bike. To be honest, we had not ridden dirt at the Sugar Hills all winter. With some shaping (and no time to test) during the week, we were hoping that things would work out for the mini-FAT-JAM. It's a good motivation to fix the trails up as you are inviting people to come ride and they're expecting something rideable when they show up. With months waiting for sunshine it was the MINI FAT JAM to start with the good weather, so the party started at 3 p.m. instead of 9 p.m. I was surprised to see a poster taped on the Mini ramp says that OJA had a band playing that night: LUPU NEGRU. Never heard of the band so I thought it couldn't be any good cause they booked them only a couple of days before but when CornÃ© visited my shop he said he was at a Lupu Negru concert the day before and it rocked so I might got it wrong. For the second year in a row the Backyard jam is an indoor affair. The series of three is divided over three indoor spots in England. Round one took place at the BIC in Bournemouth. Paul and I had left in the Vito on Thursday evening. We opted for the ferry so we could bring all the beer we wanted and had a place to crash in case we needed it. England is an expensive country. Diesel is more expensive than gasoline so we luckily filled up the tank before we started driving on the left side of the road. We gained an hour on arrival in Dover but were too tired to make it directly to Bournemouth. We threw all the bags on the front seats and installed the fishing stretcher and mattress in the back of the van. Luckily it wasn't cold and the night went by quick.